As promised, here’s the first-ever installment of our Destiny Crucible strategy guide. I’ll be visiting a planet each day, covering all maps playable in all game types as well as how Spoon Deep plays them. By the end, you’ll know how we play, and maybe you’ll find your own success in our strategies. But maybe you won’t, and that’s okay! If you have a different strategy than any discussed here, please let us know in a comment below! Or, if you’re feeling up to it, leave your gamertag (we play on Xbox One) and challenge us in-game. We’d love to test out your new strategy, but we’d much prefer you put that strategy to the test against us in battle. Are you spoon deep? Oh my RNGesus it’s hot. It’s not like you don’t believe them when they tell you, but you don’t really know, you can’t really know, until you’re here, basking in this overwhelming light and heat. Never has such an average star seemed so brutal, so extreme. I feel dry, right down to my very bones. I can’t speak. Even drawing breath hurts…it’s almost like not breathing at all. I can’t feel the moisture in the air, can’t feel my blood flowing, and my veins…they look dark, almost black in color, screaming for oxygen. I feel dry, to the most extremist definition of the word; the dryness of the air as it scrapes by what’s left of the inside of my throat and into my boiling bloodstream, the dryness of my bloodshot eyes as they’re sucked of all moisture, no longer capable of producing tears. My eyes are red and unfocused, the radiant sunlight poisoning them from such a close distance. My vision is blurry. I can barely make out my enemies around me. But they’re in the same state…just as dreary, just as dehydrated, just as weak and dying. Why was I placed here? What did I do to deserve this? We almost feel sympathy, forced to fight each other like this. We all know how it feels now, and we want to go home, back to Earth, where there’s grass and sky, water and life. Mercury isn’t barren, it’s boiling; a boiling chunk of metal too hot to stand on, let alone walk, run, fight, and die. And we will die, most of us. But I’m not scared. Death seems tame, even gentle now. But no, I must persevere. I must go on. I must not die…I won’t. The Burning Shrine is a small map located on Mercury and is this planet’s only map, PvP or PvE. It contains long, variously obstructive hallways and is actually a map I enjoy more often than not. Here’s why. 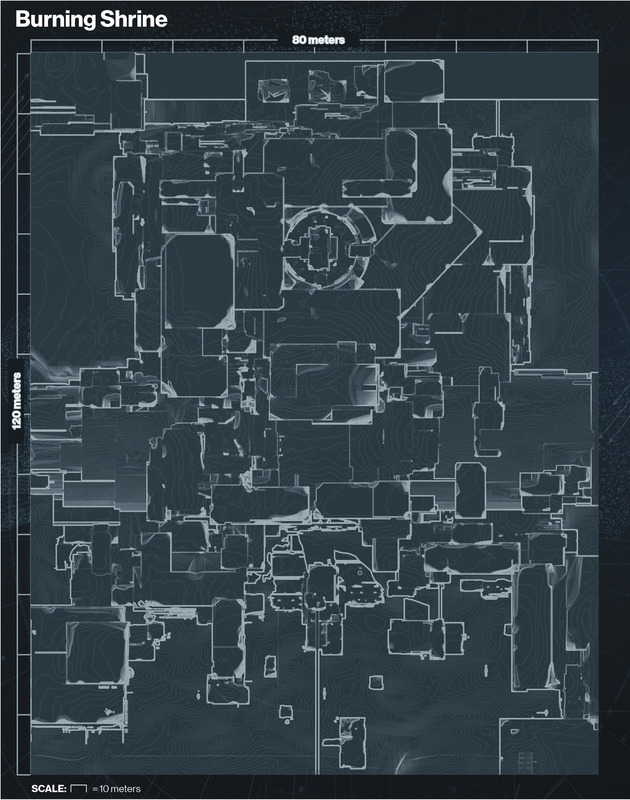 Too small to sport any kind of fair 6v6 competition, The Burning Shrine is not a map to host Control or Clash. Now, I don’t play much Rumble, but Jake, Dupie, and I make a pretty solid Skirmish (and Salvage) team, and The Burning Shrine is a map on which we excel. Sporting long shooting lanes in multiple sections of the map, as well as some close-knit, jagged hallways, The Burning Shrine will cater to both long- and short-range players alike. We prefer to stay all the way to one side of the map or the other, where we can see the enemy coming in from the sands outside, down the center with its mysterious blue beam and rotating rock slabs, from the sparsely connected hallways running above the center, and even from the side furthest in near the interior heavy spawn. Learn the heavy spawns, as these pretty much dictate the outcome of any kind of fair matchup. One spawns in the middle of the outdoors sands section, near the back, and the other spawns on the raised platform in the middle of the map’s opposite side. On this, and every map (except First Light and Bastion), the first heavy will spawn at 9 minutes remaining, with each subsequent heavy spawning 3 minutes after your previous pickup, so learn to glance at the clock every now and then to stay on top of it. Stay out of the middle, control the heavy, ?? ?, profit. You’ll do great, Guardian. Godspeed. To Venus tomorrow…wish me luck.